I get so excited when I make a trip to Trader Joe's because my trips are few and far between. The closest one is a good 30 minutes away and dragging 3 boys there is not my idea of fun. They have so many yummy things there but one thing I always grab is their tub of mini-cookies. Best cookies, ever. But they are so darn addictive. They are bite-sized so I just keep on popping them into my mouth. I bought this tub yesterday and it is almost empty. I literally had these for lunch today. Oops. For the record, I bought other things besides cookies during my trip yesterday. I picked up their Organic Vodka Sauce, which is actually cheaper than other conventional jarred sauces at the grocery store. We had it for dinner over some rigatoni and along with TJ's Italian Style Meatballs. Absolutely delicious. I love that store. 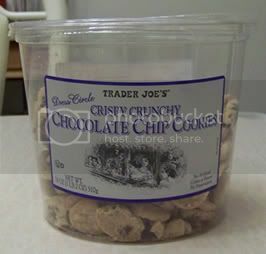 What are some of your favorite things from Trader Joe's? I need to make a list of things to try out. I love their fresh hummus with the organic baked pretzel bites. Yum. The nearest one to me is over 20 minutes away also. I would love to have one move closer. This isn't the healthiest...but still SO yummy...I love their chocolate covered pretzels, peanuts & almonds.